« Corked up — never! With soft snow falling like rain — and the last light of the last day of the year — I hurry to a last minute post to mark the passing of everything old and rotten and no longer useful, and jump for joy for everything (EVERYTHING) that has happened since we took the next step in our Love Project with me coming to live here in commune with you. Never (NEVER) in my worst nightmares could I have imagined the difficulties and challenges of my crazy hop from Seattle to German Zschachenmuehle. Never in my wildest dreams could I have foreseen the depths I had to encounter to enjoy dizzying new heights of bliss, fun, and sheer sexual pleasure that keep finding me in all sorts of moments here with you. Tears and screams, long walks with you in the Thuringen woods, wild dances in White Robe Meditation, and running through it all like the thread of our old malas, Osho, Osho Osho! Will I be able to do some ‘justice’ to the heart-wrenching conversations and being-opening intimacies we have been led to share with each other as male and female? I promise to say much more here in the New Year, whether I can or not! In the East people have condemned the body, condemned matter, called matter “illusory,” maya – it does not really exist, it only appears to exist; it is made of the same stuff as dreams are made of. They denied the world, and that is the reason for the East remaining poor, sick, in starvation. Half of humanity has been accepting the inner world but denying the outer world. The other half of humanity has been accepting the material world and denying the inner world. Both are half, and no man who is half can be contented. You have to be whole: rich in the body, rich in science; rich in meditation, rich in consciousness. Only a whole person is a holy person, according to me. I want Zorba and Buddha to meet together. Zorba alone is hollow. His dance has not an eternal significance, it is momentary pleasure. Soon he will be tired of it. Unless you have inexhaustible sources, available to you from the cosmos itself…unless you become existential, you cannot become whole. This is my contribution to humanity: the whole person. This Dionysian character is the very picture of a whole man, a “Zorba the Buddha” who can drink wine, dance on the beach and sing in the rain, and at the same time enjoy the depths of understanding and wisdom that belong to the sage. In one hand he holds a lotus, showing that he respects and contains within himself the grace of the feminine. His exposed chest (an open heart) and relaxed belly show that he is at home with his masculinity as well, utterly self-contained. 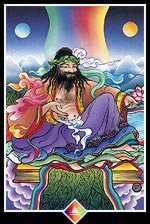 The four elements of earth, fire, water and sky all conjunct at the King of Rainbows who sits atop the book of the wisdom of life. If you are a woman, the King of Rainbows brings the support of your own male energies into your life, a union with the soul mate within. For a man, this card represents a time of breaking through the conventional male stereotypes and allowing the fullness of the whole human being to shine forth.